Scherer, a coal-fired power plant and one of the nation's top carbon dioxide emitters, stands in the distance in Juliette, Ga.
Looser carbon dioxide limits for new coal-fired power plants unveiled by the Trump administration are unlikely to spur construction of any new coal-fired power generation on their own but could be a crucial piece of a broader strategy in the president's bid to revive coal. The U.S. Environmental Protection Agency's proposed rule aims to "ensure any new coal plants built in the United States use the most advanced, clean coal technologies that have been adequately demonstrated." While the industry said the Obama-era limit essentially outlawed the construction of coal plants without cost-prohibitive carbon capture technology, the Trump administration's proposal moves the bar to a level already achieved by several coal plants running today. 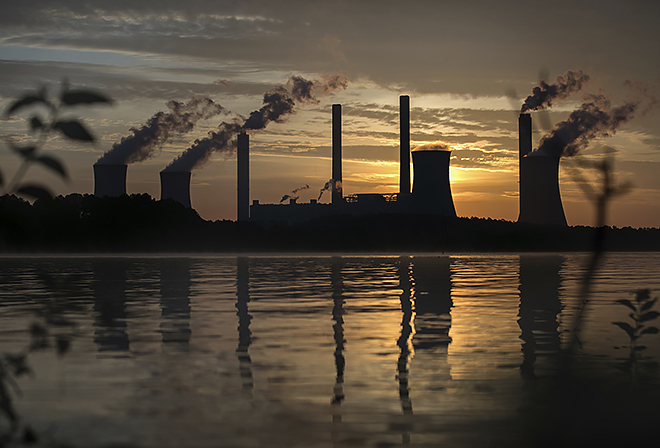 Although the EPA's modeling does not account for other pending actions from the administration to support coal, the agency acknowledges that new coal plants are likely to remain an uneconomical prospect under current market conditions. "The modeling demonstrates that coal-fired steam generation capacity is not projected to be built in the absence of any CO2 emissions standards," the EPA wrote. "Prevailing economics favor the construction of other types of capacity that are able to meet future demand at a lower overall cost." The Obama-era rule set a limit of 1,400 pounds of CO2 per MWh for new and reconstructed coal-fired power plants. The new proposal would raise the limit to 1,900 pounds of CO2 per MWh for large coal-fired generating units and to 2,000 pounds of CO2 per MWh for smaller units. The vast majority of the nation's existing coal fleet, at least 378 generating units, emit more CO2 than would be allowed by new plants under Trump's proposal. However, there are at least 67 power-generating units in the U.S. using coal as the primary fuel source and totaling roughly 39.2 GW of capacity that already emit carbon dioxide at a rate that would fall between the Obama-era standard and the new Trump proposal, according to an S&P Global Market Intelligence analysis of units for which unit level emissions and gross generation data is available. Some of the plants emitting less CO2 than allowed by the new Trump standard were built as early as 1957. Longview Power LLC's advanced supercritical coal-fired power plant in West Virginia is capable of meeting the standard and has been in operation since 2011. While the plant cost around $2.0 billion and fell into bankruptcy shortly after it was built due to market changes and construction defects, President and CEO Jeffery Keffer said it now boasts the lowest dispatch cost of any fossil fuel plant in the PJM Interconnection and could be built today without as many problems. Keffer said the company has advocated for a proposal like the one just released by the Trump administration, but over the past two years other factors have lined up against coal, including pressure from investors and financial institutions to move away from the fuel. "A lot of effort has been put into trying to save existing, much older coal plants and the problem with that is those plants are becoming more and more uneconomic, more expensive to run, and not competing," Keffer said in an interview. "The older coal plants are not going to last. They're not economic. They're highly inefficient and regardless of what efforts are made to try to subsidize them, you can't subsidize them forever unless you're willing to pay a significant amount." Even under high-demand growth projections, the EPA's estimate suggests, renewables and natural gas capacity additions are expected to pick up the slack instead of new conventional coal plants. However, its modeling does not incorporate potential federal policy intervention that could come from the administration. The EPA specifically references "mechanisms to incorporate value for onsite fuel storage" — an allusion to so-far-unsuccessful efforts to incentivize coal plants in the name of national security and reliability — in the caveats surrounding the accuracy of its model. It also does not account for the potential successes of a U.S. Department of Energy program seeking proposals to support research and engineering designs for smaller, flexible coal plants that could compete with and more closely mimic the operation of natural gas generation capacity. Michelle Bloodworth, president and CEO of the American Coalition for Clean Coal Electricity, said proposed legislation aimed at providing tax credits for operating and maintenance expenses at existing coal-fired power plants could also spur coal development. Another important bill for the sector, she said, would expand a federal loan guarantee program for carbon capture and storage projects to also apply to high-efficiency, low-emissions coal plants. "I don't think there's one silver bullet," Bloodworth said in an interview. "We're just hoping that it sends a signal — as there are more discussions around fuel security, resilience and reliability — of the importance of the coal fleet that would incentivize people to want to build and invest in new technology for the coal plants of the future." The problem for the companies mining and selling coal is that the industry's primary customers, domestic utilities, are also facing social and economic pressure to move away from coal. "Our customers need to feel confident in the generation investments that we're making," Duke Energy Corp. spokeswoman Kim Crawford said in recent comments about the company shutting down multiple coal units as it adds natural gas and renewable generation to its portfolio. American Electric Power Co. Inc. has factored future carbon regulations into the company's evaluation of generation resource options for many years and will continue to do so, spokeswoman Melissa McHenry said in a recent statement made before the Trump administration announcement. While acknowledging the proposal is unlikely to result in a coal-fired power plant, the EPA points to the "option value" of a regulatory framework that gives power generators leeway to build a coal plant if they want to. People concerned about the climate implications of burning coal should not assume the administration's proposal is meaningless just because it projects zero new coal plant capacity, said Jack Lienke, regulatory policy director for the Institute for Policy Integrity at the New York University School of Law. While few expect the underlying market dynamic to change as much as would be needed to make coal plants preferable to natural gas generation, pricing and other energy trends are notoriously difficult to predict. "I think the original rule was best viewed as a kind of risk management strategy, hedging against the risk that gas prices would be higher than expected, and that as a result conventional coal plants would be built without carbon capture technology," Lienke said. "The effect of repealing that rule is that it reopens the risk that if market conditions change unexpectedly, high-polluting coal plants will be built instead of low-emitting natural gas plants."